Twenty-six months since Anglicanorum coetibus laid the groundwork for groups of Anglicans to cross the Tiber whilst maintaining elements of their liturgical, spiritual, theological and canonical patrimony, the top-shelf papal project has taken a sizable leap this New Year's morning, with as the establishment of the venture's Stateside jurisdiction by the Holy See. In an unprecedented Sunday announcement -- a significant sign of Rome's degree of seriousness about the effort -- the Vatican's press bulletin gave official word of the erection of the Personal Ordinariate of the Chair of St Peter, encompassing the territory of the United States. The national quasi-diocese for the entering groups is the second of its kind, following England's Ordinariate of Our Lady of Walsingham, which was launched a year ago this month. Fr Jeffrey Steenson, 59, the former Episcopal bishop of Rio Grande ordained a priest of the archdiocese of Santa Fe in 2009, has been named the founding Ordinary. A married father of three and Oxford-trained patristics scholar who's been serving until now as a professor at Houston's St Mary's Seminary and University of St Thomas, Steenson's appointment is effective immediately. 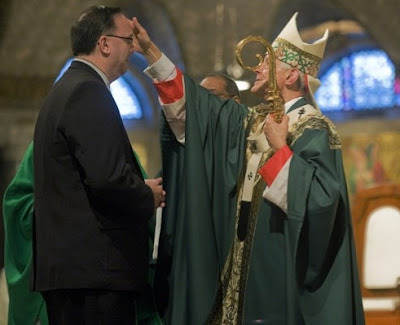 Last June, it emerged that Steenson had been tasked with preparing and overseeing the rapid formation program for American Anglican clergy entering the Ordinariate, to be based at St Mary's. From 2005-07, the married father of three served as head of the Episcopal church's most sprawling diocese, covering New Mexico and Southwest Texas. Dated today, the CDF decree establishing the structure has already been released. A press conference to mark the launch will be held tomorrow (2 January) at Houston's Our Lady of Walsingham church (top), which will be the "principal church" -- essentially the cathedral -- of the new entity. The nation's second-oldest Anglican Use community, the Norman-style church was dedicated in 2003, built by its members a decade after their reception into the Catholic fold. Begun with a dozen pilgrims, the parish now numbers more than 300 families. The designation of a principal church for the US Anglicanorum branch already places the project ahead of its English counterpart. Despite having a year's start, the UK Ordinariate is still awaiting the release of a church to serve as its hub. 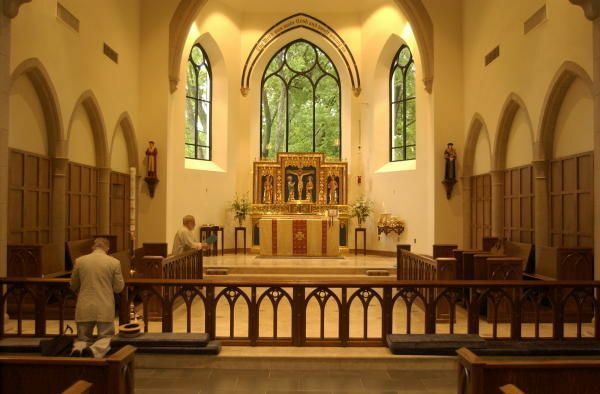 Alongside its sacramental seat (interior, above), the Stateside Ordinariate's offices are also to be in Houston, at least initially on the Walsingham parish campus. According to the body's official website, Fr Scott Hurd -- another onetime Episcopal priest who has been assisting on the Anglicanorum launch for the US bishops -- will serve the venture's first three years as Steenson's deputy or "Canon to the Ordinary," employing the traditional Episcopal church term for what Catholics would know as a vicar-general. Hurd will reportedly remain based in Washington, for whose archdiocese he was ordained. Even as Steenson (below left, in once-and-future vesture) will be able to exercise the full authority of a bishop among his nationwide flock, the Anglicanorum provisions and Catholic theology preclude the elevation of a married cleric to the episcopacy. As Ordinary -- that is, head of an ecclesial organ "juridically equivalent to a diocese" -- he will regardless have full membership in the US Conference of Catholic Bishops. 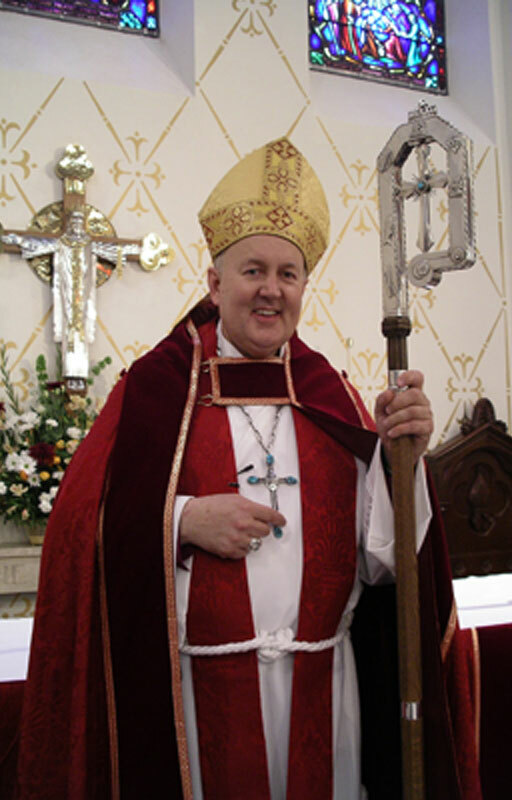 In addition, any former Anglican bishops ordained to the Catholic priesthood may use the use "the insignia of the episcopal office" after seeking Rome's permission -- which, according to one credible report, Steenson has already received -- and are entitled to sit in the episcopal conference with the status of a retired prelate. To date, one other prior Episcopal hierarch, the now-former Bishop John Lipscomb of Southwest Florida, was also ordained a Catholic priest in 2009. The 61 year-old cleric serves in the diocese of St Petersburg. Likely to include at least a thousand faithful shortly after its launch, the US Ordinariate has a key ace at the start unique among its global counterparts: the national network of Anglican Use parishes and clergy (most of them married), which may leave their dioceses and enter the new community with the consent of their current bishop. By contrast, the first three priests incardinated into the English structure -- the former Church of England's former "flying bishops" for Anglo-Catholics -- were ordained on the day of Walsingham's establishment by Rome. At the November Meeting of the US bishops, the CDF delegate on the plan's American rollout, Washington's Cardinal Donald Wuerl, reported that 35 departing Anglican clergy had, by that time, received the nulla osta -- the Roman clearance to enter priestly formation -- and could proceed to the required background checks and psychological exams. Some 100 clergy have petitioned for entrance in the first wave, and responses from the Vatican have been coming at a consistent clip over the last several months. Accordingly, in the Ordinariate's first major event, the approved candidates for orders will reportedly meet in late January at the Houston seminary to learn the specifics of their training, which could see them ordained within six to nine months. Thought to have been "biding their time" until an official start to the venture, an even larger second flank of clergy and laity are tipped to begin the journey only now that the Ordinariate has become a concrete reality. In the meanwhile, this month is likewise tipped to bring the formal reception of at least one more community -- Baltimore's Mount Calvary Episcopal church, which voted to join the Ordinariate in October 2010. Like their nearby fellow-travelers at Washington's St Luke's church -- who, with their once and future priest, were received by Wuerl in October (above) -- in a rarity, the 50-member Baltimore parish is said to be likely to retain its property and buildings. A major ceremony to liturgically commemorate the Ordinariate's start is being eyed to take place sometime in February. 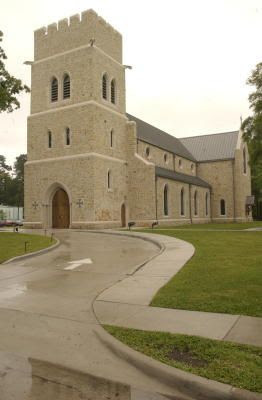 As Houston's Walsingham only fits around 300 people, the planned Anglican Use Mass marking the venture's beginning is likely to be transferred to the see city's new, 1,800-seat Co-Cathedral of the Sacred Heart. It is with great joy that I welcome the establishment of the Ordinariate of the Chair of Saint Peter, and the announcement that Reverend Jeffrey N. Steenson, DPhil, has been appointed its first Ordinary. Today’s events are the fulfillment of the hopes of many Anglicans in the United States who have longed and prayed for reconciliation with the Catholic Church while retaining cherished elements of the Anglican patrimony. The establishment of the Ordinariate of the Chair of Saint Peter is the culmination of careful preparation and much consultation with Vatican officials and the United States Conference of Catholic Bishops. I am especially grateful for the generous assistance and fraternal welcome that many local bishops have extended to those Anglican clergy and groups seeking to join the Ordinariate. As the former Episcopal Bishop of the Rio Grande, Father Steenson brings to the position of Ordinary great pastoral and administrative experience, along with his gifts as a theologian. Under his leadership, and through the intercession of Our Lady of Walsingham, the Ordinariate of the Chair of Saint Peter will both flourish and be a rich blessing to the Catholic Church in the United States. At the same time, a word of "enthusiastic welcome" for Ordinariate and Ordinary alike has come from the pioneering head of the Chair's English precursor, Msgr Keith Newton of the Walsingham group. SVILUPPO 2: Amid recent reports that the number of Canadian entrants "do not warrant" an Ordinariate of the North's own, a letter today from one of the country's leading bishops indicates that Anglican groups received in Canada will, "in due time," become part of the American Ordinariate.